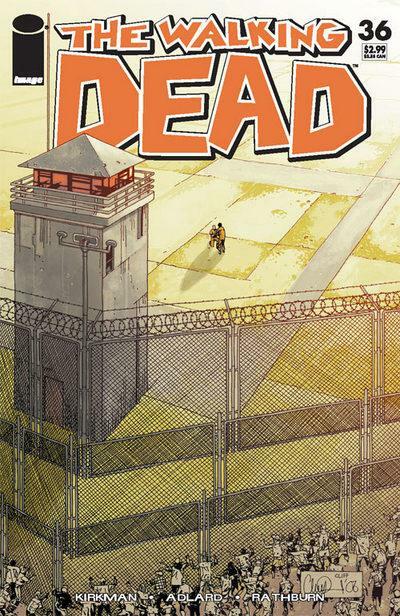 What is unusual and interesting here is the perspective this cover takes, an aerial approach shot over the Prison where Rick and his fellow survivors had taken refuge. It contrasts the emptiness of the prison compound with the teeming undead filling up the periphery, crowding around the fences, seeping into the edges of the cover itself. They are juxtaposed with the solitary humans inside the ‘safety’ of the yard. Although not as overtly ‘dramatic’ as a lot of Adlard covers, this understated piece works well in highlighting the sense of the survivors isolation, and of being outnumbered, despite the relative safety of the Prison. 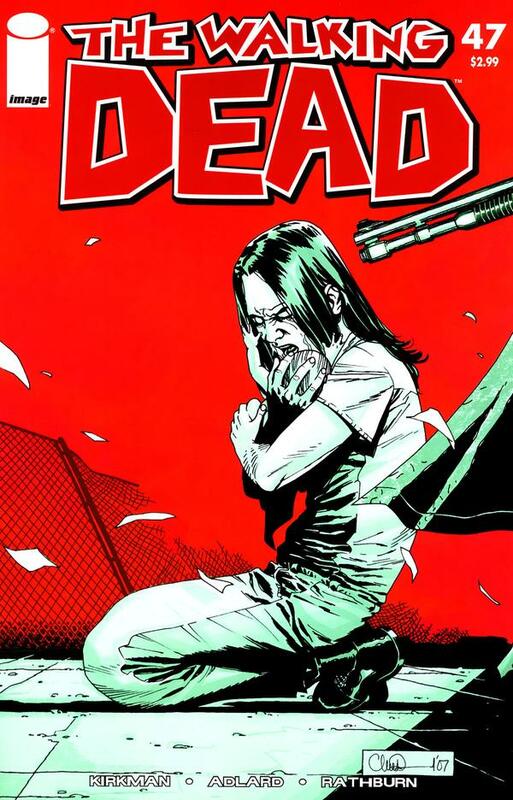 Tony Moore was the original artist on The Walking Dead, and illustrated the first six issues, to be then replaced by Charlie Adlard, who continues on the title to this day. 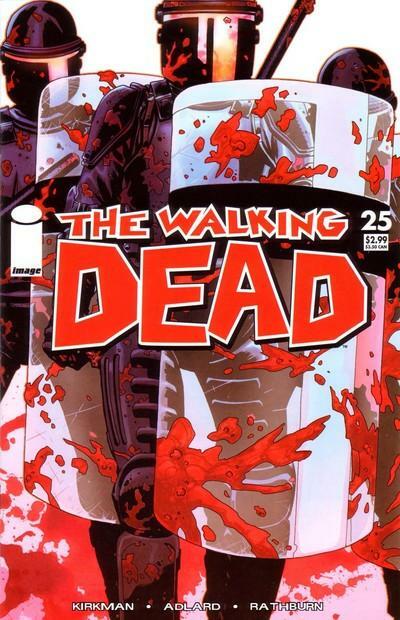 Moore did continue to provide the covers for the series until this issue, when Adlard took over the covers. This is a statement of intent – a bold, bloody statement, as Adlard transforms the survivors, with the aid of newly acquired prison riot armour, into Gladiators cutting swathes through the undead hordes, their blood splashed against the warriors shields. The placing of the title – in the centre of the cover – is another bold move and it works, as it highlights the stature and intent of the characters striding forward, almost pushing the title into your face as they do so. Another Tony Moore classic, with brilliant, vivid colours from Cliff Rathburn (whose use of colour on these covers to dramatise, set moods and define themes is a boon to the title). 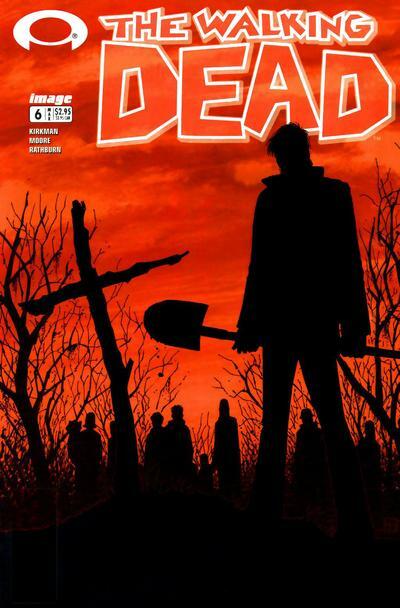 Obviously an inspiration to Charlie Adlard when he rounded off the ‘No-One Is Safe’ arc with the sombre issue #48, Issue #6 has a haunting quality, with the silhouette of Rick and the makeshift cross especially effective. The lurking danger in the background is quieted in this moment of sorrow and reflection, almost as if the undead themselves are paying respect to the fallen. All of the ‘No-One is Safe’ cover art is a treat, framed by the vivid red backgrounds courtesy of Cliff Rathburn, but this one, issue 47, is a magnificent and dramatic cover. Although the cover arts relation to the actual storytelling is tenuous (and that comes as part of the territory with this title), its all part of the fun. Taking it at face value, what you have is a very striking and effective cover. Lori, who is Ricks wife, is on the ground in a defeated pose, clutching her newborn daughter tightly while appearing to scream / cry in anguish / anger, while the helpless infant reaches out to her mother for comfort / reassurance. Over the pair stands a mysterious figure, holding a gun that appears to point at the mother and child. It a scene of death, of an execution, with the last few moments of the victims captured in chilling detail. In the background we can see that the once impenetrable defences of the prison are now broken and accessible. The danger and despair are palpable, with the despairing Lori framed against a harsh red background the colour of blood. This is just genius, and shows that despite how great Charlie Adlard covers are, it would be great if Tony Moore would contribute a new one every now and again. This cover is just so well designed and delivered, taking a unique perspective but making it easily recognisable and accesible. It shows Rick, posed as if taking a break / exhausted, seemingly unaware and in danger, from the perspective of the approaching undead, as we look straight into the eye of the zombie from point blank range, targeting its potential victim. The fly adds additional detail (maybe the dead do not blink?) but does not dilute the power and menace of the piece, with Rathburns colours understated around the edges to give clarity to the piercing blue eye of the revenant. One of the best comic covers I have seen. There were plenty of covers that nearly made it, such as the suspense of issue 33, the iamge of the apocalypse that is issue 4 and the ‘all out action’ of issue 54. 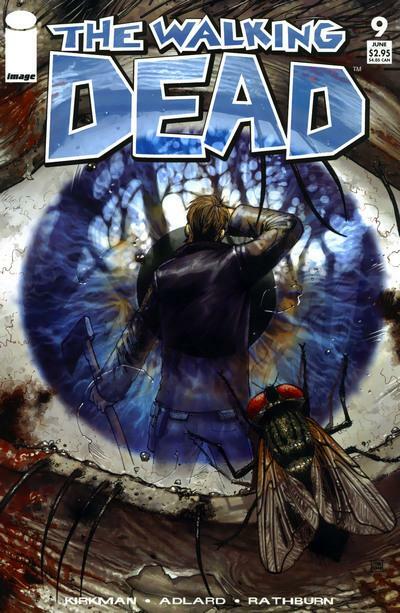 For a great overview of the cover art of this title, try here – http://www.comicvine.com/the-walking-dead/49-18166/ – a full spread of Walking Dead covers, up-to-date and with detailed information on each issue. If you are a fan of The Walking Dead then this is a truly great resource.